Padraig Harrington has shot down suggestions that the US Open is wide open this year. With Tiger Woods hobbling round on crutches at home and Phil Mickelson struggling to find his best form, pundits everywhere are talking about up to 40 title contenders. But Harrington doesn’t buy that line and remains convinced that the proven major winners will be a factor on Sunday night. Harrington rapped: “How many of the guys they are talking about are willing to go out there and put their neck on the line coming dow the stretch? There are 16 major winners in the field but only eight of them are US Open winners. But of that bunch only Ernie Els, Geoff Ogilvy, Lucas Glover and Graeme McDowell have captured a title in the last seven months. Harrington knows how tough it is to win a major title and that’s why he reckons that only a handful of players are truly ready to win this week. He said: “I suppose a lot of players would feel that bit more comfortable going in knowing there’s no pre-tournament favourite. 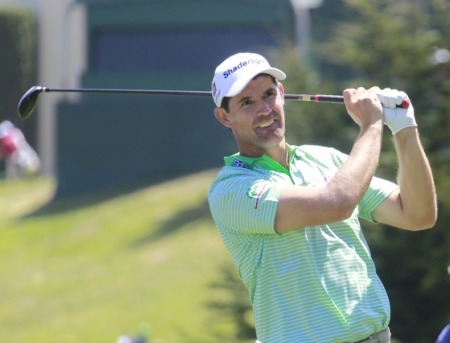 The champion will have to putt like God to lift the title, which gives Harrington an outside chance of winning his fourth major in his 14th US Open start. He said: “It’s the same thing as at every US Open, the champion will have putted well. “I think they’ve set up the course very fairly. So, realistically, the challenge is all on the greens. The putting charts show that the best putter inside eight feet is 2009 US Open winner Glover with world No 1 Luke Donald ranked fifth and Harrington seventh. But the Dubliner knows that he will have to find a way of hitting the fairway from the tee if he is to use that putting prowess to contend. He’s hit just over half his fairways this year, leaving him a disappointing 167th in the PGA Tour driving accuracy charts. And he’s far from confident that he can find a way to compete after his recent layoff with knee and hamstring problems disrupted his build up. After finishing 52nd in Memphis last week, he said: “I didn’t hit it as well as I’d have liked early on last week and there’s been a little bit of corrective work there. That’s never great the week before a tournament. Despite that he believes he can still grind his way into contention on a course where chipping and putting will be more important than ever. He said: “I fully believe that I can contend, 100 per cent. I’m in good stead and hitting the ball well. Padraig Harrington feared he would be labelled a one-hit wonder if he failed to win another Major. Mature Harrington no longer "a lunatic"
“There wasn’t a Monday, Tuesday or Wednesday of a major or any tournament where I wasn’t running around like a lunatic trying to find something. I understand that if you don’t settle yourself down from Monday to Wednesday you are not going to be calm on Thursday. And you are certainly going to run out of energy by Sunday. Feherty on Tiger: "He’s like a badger in a set right now and he’s not coming out for anybody. Not for me anyway."